Gone are the days, when printing merely meant for business purposes. Now-a-days, your primary grade kids too needs a printer to print there creativity on paper. Epson brings the finest range of printer, to serve your this purpose; and several others. Epson L565 Multi-function Printer, is a package to solve all your printing related activities. As the name suggests, it's a 'Multi-Function Printer'. Get some better insight, to it's functions, from here. When Epson says, all-in-one; it literary means it. This one from Epson comes with multiple functions viz. Scanning, Copying, Faxing with built-in ADF, Ethernet, WiFi & Epson Connect. This makes sharing pretty simplistic. Printing gets seamlessly simple, whether you want print your document through a laptop, desktop or mobile. 30 page automatic document feeder makes printing, scanning & faxing very easy. You can also send broadcast fax and multiple documents at one time. The all-in-one printer from Epson, is smart on after-service front too. 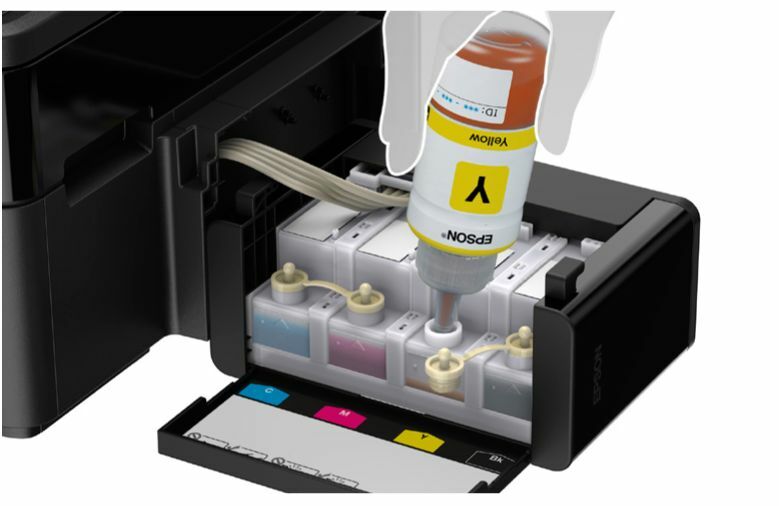 Epson L565 is designed in a manner to save you bucks while refilling ink tank too. The black ink tank is designed in a manner to print about 6500 pages for colour, or 4000 if that is of black. Re-filling is also an easy process here. Ink tubes are also designed in a way, to make the optimum utilisation of ink. 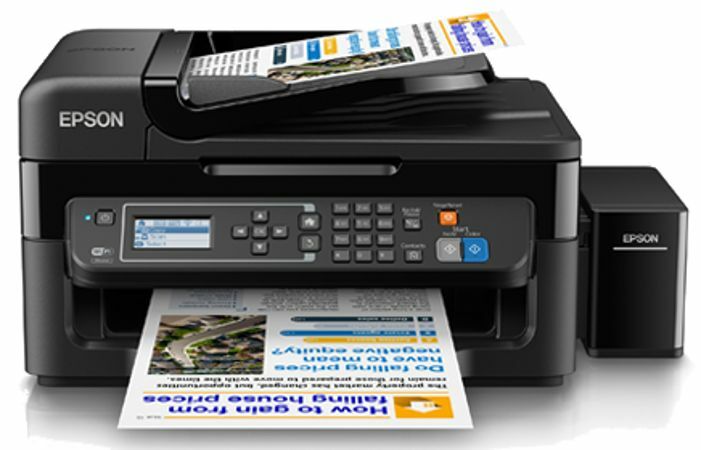 Epson L565 is that all-in-one printer, that ensures you a broad terrain of connectivity. You can connect and print through WiFi and WiFi direct. While other connectivity options includes options of direct printing from mobile device & cloud storage. You can share your scanned documents directly through mail, or store them in cloud storage. The printer easily connects well with Apple & Android devices too. Through Epson L565 is expansive in it's functions, it is designed in a manner to fit in a small space too. Classic Design of the printer, is artistically designed by cutting down on excessive space that conventional printer used to demand. Be it your office or home, this one adjust itself conveniently in small space. This one from Epson comes with the printing quality of 5760 dpi. While the ink bottles are crafted in a manner to deliver high-quality printing. Purity of the ink is retained well, with sealed ink bottles, which also ensures of mess-free refills. Quicker & faster printing of this printer is surely going to astound you. Cause this one prints with the speed of 9.2 ipm, while draft print speeds up to 33ppm. Reliability of the brand comes, with the warranty that it comes with. Yes, the warranty of the printer covers printhead too. Which indeed is an significant aspect! This is my first shopping from Infibeam, and I am satisfied with the service of Infibeam. Its just been 2 days and the printer is working fine as of now. The service by Infibeam was great. It is a perfect printer. It is cost-effective, has wireless connection and has amazing quality. Infibeam provided a prompt delivery at incredible price. Very much happy. Got product within a week. Service is good. And product too Genuine. Great! Happy with the delivery, spot on. received the printer in good condition. so far so good, working well. took us few minutes to set it up and running. Awesome This printer i buy 13500 only infibeam website. Quick delivary. Super printing quality. Received the product in mint condition, packing is good, received at best price... very happy with the product. The ink quality of this printer is really nice.. The font printed are bright and clear..
How useful is to have an printer at home.. Thanks Infibeam, for bringing me this printer at reasonable rate..